Each year millions participate in filling out brackets for the NCAA tournament. A March Madness Brackets Guide can help. Many have their own ideas, and many seek help from outside sources. This article will help you with guidelines for filling out your March Madness / Final Four brackets. It will also help in making March 2012 Madness Bracket Predictions. Also, check out our other free March Madness Picks resources. If you haven't already, be sure to sign up for our free college basketball picks newsletter to get our picks for the tournament. Hello Wunderdog, this is a belated thank you for the $15 dollar NCAA basketball bracket. Using your exact picks I won $660 in one pool $550 in another. I haven't told anyone they were your picks and not mine, but you deserve some recognition so I will spread the word about you to other bettors like myself. Thanks again. Looking for NCAA Picks and Completed Bracket? Also I want to thank you for the great bracket you compiled for March Madness. Three off the four teams in the final four and the winner. Even before the final four I knew I won the bracket contest at my work. $20 to win $150 wasn't a bad investment. Start your March Madness Bracket Predictions with the Final Four. Going back to 1997 when the last of the six major college basketball conferences was born (the Big 12), 90% of all Final Four teams were from one of these six conferences. The "Power Six" as I call it consists of the ACC, Big East, Big 10, Big 12, Pac 10, and the SEC. Two of the teams "other conference" teams that made it to the Final Four since 1997 (Marquette in 2003 and Louisville in 2005) are now part of the Power Six Conferences. Taking that into consideration, 95% of the Final Four teams are now part of the Power Six. Empowered with that information, my suggestion is to fill your brackets out starting with the Final Four (utilizing teams from the Power Six of course) and working backwards. Just wanted to thank you for your NCAA bracket picks this year. Your March Madness Bracket Guide really helped me. Even though Kansas was upset rather early, your first and second round picks carried me in first place all the way to the championship game in my office pool !! If Duke would have lost outright, I would have won first place. I instead took second place and felt very good about it !! Thanks again. I will be a returning customer. Get free NCAA Tournament Picks here. Everyone knows that the tournament starts with 64 teams (after play-in games), but few people have probably done the math to figure out how many possible brackets could be created without duplication. I have done such math work (as I am sure you are interested) and found this number (based on 64 teams) to be 9,223,372,036,775,808possible brackets. Below I try to provide some information to narrow down to fewer choices to help you select the best possible bracket to win your pool. Matchups #1 vs. #16 and #2 vs. #15: How bold do you want to be? To start with, finalize your #1 seeds to the next round. There has never been a 16 seed that has won since the bracket moved to 64 teams in 1985. The 15 seeds are have won just four times since 1985 (in over 100 games) which means you are pretty safe putting the #2 seeds through. Matchups: #3 vs. #14 and #4 vs. #13: 90% is pretty darn big! Moving on past the #1 and #2 seeds, you now have two possible directions in which to move. One way to go is to pick a few upsets with the best chance of turning Cinderella and hope they pan out. Or you pick every upset so you are able to brag to your friends that you selected the upsets in the early rounds and let them laugh at you when you have no one left come the Final 4 (where the points add up). I believe that it is best to have a few teams in mind and not to go over-board on upsets. For this reason, as long as it doesn't conflict with your Final Four predictions, I recommend you fill in the #3 and #4 seeds to win their games. The reason for this is that the #1, #2, #3 and #4 seeds have won about 90% of the time since 1985. As I have said, there is a good chance one of these teams will lose in the first round but since that is so hard to predict, the odds are in your favor to have them all move on after the first round. By moving all these teams to the next round, the possible number of brackets drops all the way down to just 140,737,425,855,328. This is clearly a high number but significantly lower than the original number we started with. Matchups: #5 vs. #12, #6 vs. #11, #7 vs. #10 and #8 vs #9: Upset territory! These pairings are the hardest to call. The most upsets come within these ranges and here's where your bracket is made or broken. The #5 vs. #12 has historically provided some of the greatest and most consistent upsets in the tournament. Nearly every year we see one or more #5 seeds losing. Sometimes it's two or three. The trick is identifying which #12(s) will be the ones to pull off the upset. The 7-10 and 8-9 match ups are pretty much toss ups any way you look at them. Since 1985, #7 seeds have won about 60% of the time and #8 seeds have won about 45% of the time. That being said, it will take more than just picking a "higher seed" to overcome the average fan selecting their bracket winners. In this round, the rate of straight-up wins by underdogs is 5% higher than in the tournament as a whole. Sunday is the day for underdogs in this round, as the lower seeds have hit nearly 50% in recent years! The biggest challenge has been faced by the #2 seeds squaring off with a #10 seed. In this situation, #2 seeds have actually posted a lost record in recent years. But, when a #2 faces a #7, they win at an expected clip. If you have a match-up of a #2 vs. #10 in this round, you may want to give strong consideration to the lower seed. The Cinderella candidates emerge from the #10, #11 and #12 seeds in this round. These teams after winning their first round games have hit close to 50% this round to advance to the sweet 16. When making your Sweet 16 picks, keep in mind that it is rare to see all #1 seeds reach the Elite Eight. It has happened only a handful of times since the tournament began. These matchups are comprised by about 25% #1 vs #2 seeds and close to 20% are #1 vs #3 seeds. Only about one tournament in every ten have seen both teams in these matchups that are both #4 seeds or lower. About two-thirds of #1 seeds reach the Elite Eight and about three-eighths of #2 seeds reach the Elite Eight. The history shows that about 67% of the Elite Eight teams are either #1, #2, or #3 seeds. The rest of the teams are pretty balanced from higher seeds, but mostly in the #4-10 range. So you should consider having one match-up of #1 vs #2, and likely another #1 vs #3. You should also think about having four or five teams seeded in the #1-#3 range advancing to the Elite eight. Once the tournament reaches this round, the upsets drop-off significantly. This round has seen large underdogs (defined as being 4 seeds or more lower than their opponent) pull off the upset only about 15% of the time. Accordingly, it would not be in your best interest to try and advance one of these teams past this round unless you have a really good reason - otherwise you are fighting an 85% trend. For my exact thoughts on the bracket and my full March Madness Bracket predictions, my Final Four picks and my National Championship pick, you can order my filled-out bracket in March here. Good luck in your brackets! 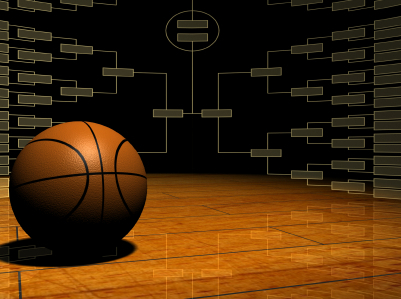 Check out my other free March Madness Picks resources.